Regan is from Durant, Oklahoma. She had a full ride scholarship to play basketball for East Central University in Ada, OK. She graduated with a degree in criminal justice. Things soon became a blur due to her alcohol addiction. 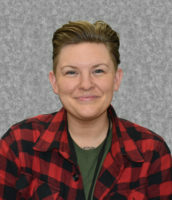 Regan entered our program in January of 2017 and soon became a house manager for our women’s house She then came onto our office staff as our administrative assistant and has recently moved into an Intake Coordinator position.